There was a fair-sized flock of winter thrushes in the cut maize field along the approach to Moreton Cottage today, with quite a few Chaffinches with them. A Little Egret was seen in flight there. The drake Red-breasted Merganser was still present off Nunnery Point this evening, as usual displaying to every female Goosander he could find (most of which were already paired with drake Goosanders). The rather distant gull roost this evening produced a couple of adult Mediterranean Gulls, and an adult Ring-billed Gull. The latter was a nice find, as we don't usually start imagining these in the roost until February. There was another vast Starling roost in the Moreton Bank area this evening. An adult Mediterranean Gull was on Herriott's Pool this afternoon. Some other items of interest were two sinensis Cormorants already in full summer plumage on Stratford Islands and another big (by Chew standards) Starling roost on Moreton Point - although no estimates were made, numbers were certainly in the tens of thousands. A Tawny Owl was heard calling from the cypresses at Moreton Cottage. There continue to be large numbers of Winter Moths on the wing on mild evenings around the lake. As an example of how numerous they are, I counted 101 whilst driving between Norton Malreward and the A37 at Whitchurch this afternoon (a distance of 2.1 kms). Above: 4th-winter gull showing characters of American Herring Gull. Note in combination the heavily streaked and blotched head and breast, the very pale upperparts, the flat head and long, thick bill (contributing to a 'severe' look), a short black line in the tertials, black lines in the outer primary coverts, and retention of black shaft streaks and other markings in the tail (Keith Vinicombe). The Great Northern Diver was present very briefly off Moreton hide this afternoon, as was the drake Red-breasted Merganser. A Great Northern Diver was seen very distantly off Nunnery Point (towards Spring Bay) late this afternoon. Hot on the heels of yesterdays Tree Sparrow, a Yellowhammer was another good Chew bird this morning - seen briefly at Nunnery Point/Heron's Green Bay. There were a couple of Water Pipits at the point, with the drake Red-breasted Merganser also there. A Little Egret was seen in flight over the Parkland, then later at roost on Denny Island. An adult Mediterranean Gull was seen in the very distant gull roost this evening. A Bittern was watched for over an hour on Herriott's Pool early this afternoon; it was perched on the edge of the reedbed on the east side, just north of where the small channel enters the pool. It clambered back into the reeds out of view, but later reappeared at dusk. Presumably it's been pushed in by the freezing weather last week - many smaller waters will have frozen (it was minus 5 degrees in Bristol at one point). 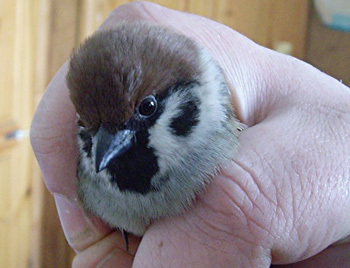 Further excitement was caused by a Tree Sparrow, trapped at ringed at CVRS - their first since 1983. This species once bred at Chew, but in recent years has become extremely scarce - this is the first record since I started the CVLbirding website. 26 Pintail were on Herriott's Pool, and a male Stonechat was at Nunnery Point. No sign of the Great Northern Diver this week. On what was a fairly mild afternoon (after freezing temperatures in the week), there were loads of Winter Moths on the wing just after dusk, and even a bat sp. over the Parkland. No sign of the Velvet Scoters today. A proper surprise this afternoon was a group of five Velvet Scoters in Stratford Bay. All appeared to be first-winters. There are four previous records at Chew - November 1983 (two birds); January 1984 (one); November 1984 (five); and October 2005 (three). The juvenile Great Northern Diver was also in front of Stratford hide late this afternoon. Presumably we have the recent cold easterlies to thank for these birds. Two Siskins were seen in the alder wood behind Stratford hide, but the most unexpected bird of the day was a Reed Warbler - it was seen very briefly in the reeds three or four metres to the right of Stratford hide at 16:20. A juvenile Great Northern Diver was seen from Bernard King hide near Denny this afternoon. The bird seen last weekend was the adult that was first seen on 27th November, so this is obviously a new bird. It was then seen again in the gloom off Woodford Bank this afternoon shortly before it got dark. Two Mediterranean Gulls were seen in the roost. The manky Cormorant remains found on a tree stump last weekend were given a poke with a stick today - the penny then dropped that the nearby rubber fish was in fact a Pike lure, which was attached to a wire, which was in turn attached to a the inside of the Cormorant's skull with a big metal hook. Lovely. A Barn Owl was watched hunting around Heron's Green Bay this afternoon. The Great Northern Diver was still present today (near Denny). Other birds seen today included one Little Egret, the Red-breasted Merganser, a Water Pipit (behind Moreton hide), a Chiffchaff and 88 Wigeon - the latter has been something of a scarcity at Chew in recent winters. The gull roost this afternoon produced a Herring x Lesser Black-backed Gull and two argentatus Herring Gulls. Another day of rain and wind - there was a lot of standing water on the roads around Chew today, and the lake is now rapidly filling up. The Great Northern Diver was on the Roman Shallows this morning (from Stratford hide); other counts today included 11 Snipe, 37 Goosanders, one Red-breasted Merganser, one Kingfisher and one Green Sandpiper (the latter on the newly-excavated wildlife pond at Woodford Bank). Two Mediterranean Gulls (an adult and a second-winter) were in the roost this afternoon. Three Mediterranean Gulls were seen in the gull roost tonight in dreadful weather. A Green Sandpiper was the only other bird of note. In a bizarre and evidently erroneous story in this morning's Western Daily Press, a 'colony' of Kittiwakes was reported to have been blown in to Chew by the strong winds yesterday. The full story, plus one of the published photos showing one of the 'Kittiwakes' captured on camera (a Black-headed Gull), can be seen at www.westerndailypress.co.uk. Quite why the Western Daily Press thought the story was remotely newsworthy (enough even for a half-page article) is anybody's guess. An unseasonal Spotted Redshank on the dam wall at Heron's Green Bay was a surprise today; nearby there were three Little Egrets at the end of the bay. The Great Northern Diver and drake Red-breasted Merganser were still present, and a juvenile Peregrine was also reported. The Great Northern Diver was still present today, viewable from both Moreton and Stratford hides. A Jack Snipe (Moreton) and the drake Red-breasted Merganser (Heron's Green Bay) were also seen. Two Little Egrets were in Villice Bay this morning. The Great Northern Diver was off Sutton Wick this afternoon, and two Little Egrets were on Moreton Bank. An adult Yellow-legged Gull or two, and an adult Mediterranean Gull were in the roost, with a drake Red-breasted Merganser and 29 Goosanders close-in off Nunnery Point this afternoon.